Venus Williams is an American tennis player, currently ranked as #9 in the world. She is often referred as one of the greatest female tennis players of all time. She is the winner of 7 Grand Slam singles and 14 doubles titles in addition to 4 Olympic medals, being the only tennis player to win a medal at four Olympic Games. Venus Williams was born on June 17, 1980, in Lynwood, California, USA, in the family of tennis coaches. She is the elder sister of another tennis player, Serena Williams. Starting to train in early childhood, at 12, Venus was already #1 under-12 tennis player in Southern California. In 1994, Williams turned professional. In 1997, she debuted at the French Open, her first Grand Slam tournament. The same year, she reached the first Grand Slam final at the US Open. The athlete earned her first singles title at 1998 IGA Tennis Classic. That year, she was also the winner of Lipton International Tennis Championships and Grand Slam Cup singles titles as well as doubles titles in Oklahoma City and Zurich. In 1999, together with her sister Serena, Venus was the winner of the French Open and US Open in doubles. In singles, she won Betty Barclay Cup and Pilot Pen Tennis. In 2000, Venus Williams gained her 1st and 2nd Grand Slam singles titles at Wimbledon (in addition to a title in doubles) and US Open. Also, she won Bank of the West Classic, Acura Classic and Pilot Pen Tennis as well as gained 2 gold medals in singles and doubles at Olympic Games. In 2001, the tennis player was the champion at Wimbledon, US Open, Ericsson Open and gained a doubles title at Australian Open. Among the titles, gained in 2002, are Mondial Australian Women’s Hardcourts, Open Gaz de France, Proximus Diamond Games, Bausch & Lomb Championships singles and Wimbledon doubles. In 2003, Williams was the winner of Proximus Diamond Games in singles and Australian Open in doubles. The next year, she won Family Circle Cup and Warsaw Open. In 2005, the athlete gained her third Wimbledon title in addition to the one at Istanbul Cup. 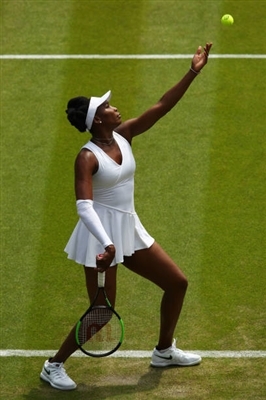 After gaining no titles in 2006, the next year, Venus Williams won Wimbledon, Cellular South Cup and Korea Open. In 2008, she earned the titles at Wimbledon in both singles and doubles, Zurich Open, WTA Tour Championships and claimed a gold Olympic medal in doubles. In 2009, Venus won 4 doubles titles at Australian Open, Wimbledon, Bank of the West Classic, US Open and was a singles champion at Dubai Tennis Championship, Abierto Mexicano Telcel. In 2010, the athlete won Abierto Mexicano Telcel in singles and Australian Open, Madrid Open, French Open in doubles. Having missed the major part of the season in 2011, the following year Venus returned to competitions and was the winner of Luxembourg Open in singles and Wimbledon, Olympic Games in doubles. After winning Dubai Tennis Championships in 2014, in 2015, the tennis player was the champion at ASB Classic, Wuhan Open and WTA Elite Trophy. In 2016, Venus won Taiwan Open in singles and Wimbledon in doubles. In 2017, Venus Williams was a finalist of Australian Open, Wimbledon and WTA finals, but didn’t gain any titles.